Accompanying anecdote: at first, one of my professors kept refusing the cupcake offers. 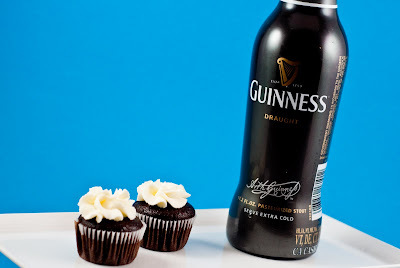 But, immediately upon hearing that the cupcakes contained Guinness, he said, "Oooo! Beer! *Now* I must try one!" Oh, academics. 2. Combine cocoa powder, sugar, flour, and baking soda in a bowl and set aside. 2. In a separate mixing bowl, combine Guinness, pudding (milk), oil, and vanilla. 3. Beat eggs into wet ingredients one at a time. Mix in sour cream. 4. Gradually add the dry ingredients to the wet. 5. Pour batter into lined cupcake pans (or make sure to butter your pans if they are not lined), about 2/3 full. 6. Bake for 25 minutes if making regular sized cupcakes and 15-18 minutes if making mini sized ones. Allow to cool before removing from tins. 1. Place all ingredients in an electric mixer bowl. 2. Beat on medium high until soft peaks form. Do not overmix! Use immediately. 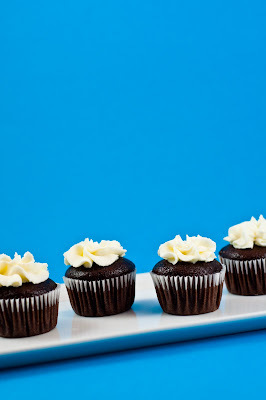 Um, how do you get those adorable little fluffs of icing on the top? Pastry bag with...what kind of tip? Oh gosh, this was so long ago, that I honestly don't remember what kind of tip I was using! But, I can tell you that the mascarpone frosting here is very fluffy, so you should be able to achieve the same effect pretty easily.